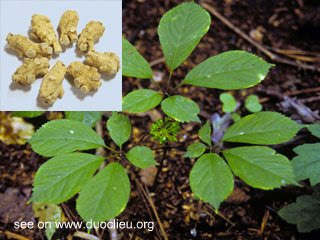 American ginseng (Xiyangshen)-Panax quinquefolium L.
Pharmaceutical Name: 1. Radix Panacis quinquefolii; 2. Radix ginseng americane. Botanical Name: Panax quinquefolium L.
Part Used & Method for Pharmaceutical Preparations: The three to six year old root is dug in autumn, dried in the sun and cut into slices. Meridians: Heart, lung and kidney. 1. Deficient yin in the lungs and excessive fire manifested as asthma and cough with bloody sputum: American ginseng (Xiyangshen) is used with Ophiopogon root (Maidong), Donkey hide gelatin (Ejiao), Anemarrhena rhizome (Zhimu) and Tendrilled fritillary bulb (Chuanbeimu). 2. Exhaustion of qi and yin from febrile disease manifested as thirst, irritability, shortness of breath and deficient pulse: American ginseng (Xiyangshen) is used with Fresh rehmannia root (Shengdihuang), fresh Dendrobium (Shihu) and Ophiopogon root (Maidong). Cautions & Contraindications: This herb should be cooked separately, then added into the decoction of other herbs. It is contraindicated for a person with cold and dampness in the stomach. It counteracts the herb Black false bellebore (Lilu). When frying or decocting, pots made from iron should not be used.